We give a basic safety and paddling technique lesson on the pool deck first, which people who do not want to participate in the water can watch from the pool bleachers for free, then have paddling practice and often races. 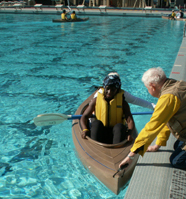 Anyone can come for the lecture and demonstration, but you must be a currently enrolled De Anza student or staff member to participate in a boat on the water. If you are not enrolled in one of the Outdoor Club advisor’s classes you must bring proof of current enrollment at De Anza or a staff photo I.D. Cost is $15 Outdoor club members, $25 non-members. $15 will be credited towards a future trip within one year for those who help with the chores until all the work is done (re-loading kayaks/gear on to the trailer, swimming back lane lines, etc.) which can take until an hour or two or even three after the lesson if it coincides with a swim class. The lesson and practice using the De Anza owned ocean and lake/river type kayaks (and sometimes a canoe) usually runs for two to two and a half hours, with the actual canoeing and kayaking taking place in the De Anza pool for about an hour or hour and a half (if we have a big group). If we have a big group, kayaks will probably need to be shared, partnerships can be formed that day. (which must be done by two people), as well as for helping pull lane lines out of the pool and hanging up wet life jackets. The Outdoor Club will make no profit from club members on this event. Cost is $15 members, $25 non-members. ($15 of each lesson participant’s fee will be pooled and split as a credit towards future events (within one year) among those who help with all the chores at the end of the lesson, until we are completely done, including canoe/kayak re-loading and help with swimming lanelines back or otherwise putting lanes lines back in place in the pool. If the lesson coincides with a swim class the chores might not finish until and hour or so after the lesson. In other words, either you stick around after the lesson to help with the chores involved, or your lesson fee pays someone else to. That’s the ‘cost’ to club members. We try to do this lesson every quarter. Outdoor Club Coming Attractions has the next date/time and how to find us to sign up. After a brief lesson, we launch and then have some practice. See: practice how to climb back in to an ocean kayak. 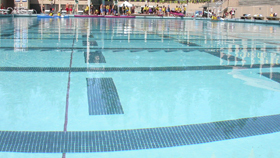 You don’t have to know how to swim, but to participate in the climbing back into a kayak of the lesson you must pass the pre-surf swim test — see next paragraph–, OR you must jump into the diving well (16 feet deep pool), while wearing a lifejacket, so wear a swimsuit under your clothes, as the locker rooms may not be open (but there are showers at the pool deck to rinse off after). test: jump into minimum 14-foot deep water, before you surface swim two full body lengths underwater, surface and tread water (not a flutter kick) for thirty seconds, then swim a minimum 35 yards head-up crawl or head-up breaststroke (all this without stopping). Instead of taking the swim test, you can provide a current Red Cross or YMCA lifeguard card or scuba certification. Do not take the pre-surfing swim test or the practice how to climb back into a kayak part of the lesson if you have had diarrhea or conjunctivitis (pink eye) within the past two weeks (unless you get a doctor’s release, on their official stationery, saying you are okay). This canoe/kayak lesson is a great way to get ready for our Monterey ocean kayak day trip, but most people go on it with no experience. 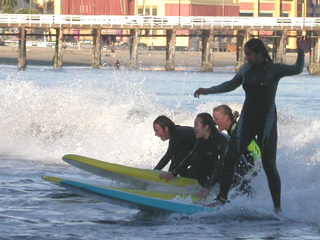 Outdoor Club Coming Attractions has the details about the date and price of our next surfing lesson and Monterey Bay ocean kayak day trip, as well as how to find us to sign up for events. The lesson is only open to De Anza students/staff/faculty. Interesting weather does not cancel club events. (rain would not cancel this lesson, but lightning would). NO REFUNDS except if the club cancels. If we cancel during the event, only people attending will get a refund. If you are so late that we have already unloaded kayaks and started the lesson you might not participate and will not get a refund. The lesson is limited to 18 people unless we do two sessions and people should sign up in advance to be certain of a place. You must either be known to the club advisor as a student or teaching assistant in one of her classes, or bring proof you are currently a De Anza student or staff. Many people wear a swimsuit with appropriate clothes as needed for the weather over the swimsuit. We recommend you wear clothes, shoes or sandals that can get wet or go barefoot (at least a little splash of water can be expected). Wear croakies or other eyewear retainers to hold on your sunglasses, and put your car keys in a safe place where they won’t fall out of your pocket into the water. Some people bring a bottle of water, or thermos of warm, non-alcoholic beverage, but please no glass containers on the pool deck. Warm clothes in the morning if it is cold are important, including non-cotton long johns and gloves in colder weather. Rain would not cancel the event so a rain jacket and pants would be wise if it looks cloudy. Some people bring a camera, but a waterproof one is the best idea (especially because most float). Bring towels and a change of clothes in case you end up in the water. Wear sunscreen and a hat with a brim for low-angle morning sun. Since you might end up in the water, do not attend this event if you have had diarrhea or conjunctivitis (pink eye) within the past two weeks (unless you get a doctor’s release, on their official stationery, saying you are okay). People must sign that they will pay for any needed repairs if they hit the walls of the pool with their craft hard enough to damage the tiles, but so far this has not happened. Nope, you can’t bring your own boat. You must wear a securely fastened lifejacket, which the club will provide. 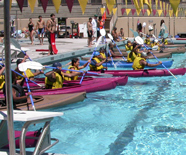 There are lots of other on campus activities at De Anza College every week. De Anza College home games also has links to student recitals, dance performances and art exhibitions. The Outdoor Club is a completely volunteer organization, neither the officers nor the advisor are paid. As a result you will not get the same ‘service’ from us as from a professional group. We do not have the time to return phone calls or emails from people asking questions that they could have found the answers to by simply looking through this website. We can’t always find a way to sign up people who can’t make it to our regular meetings, to a class when we are there, or to a table we have on campus. People who wait until the last minute to sign up are sometimes left out. Please don’t e-mail the club advisor (this website) as I don’t have the time to answer club info requests.